Hi eveyone! I hope you all had a wonderful Christmas! I have a pretty project to show you today using the beautiful music paper from the Bella Vita Collection and the staircase Pop - Out card base. 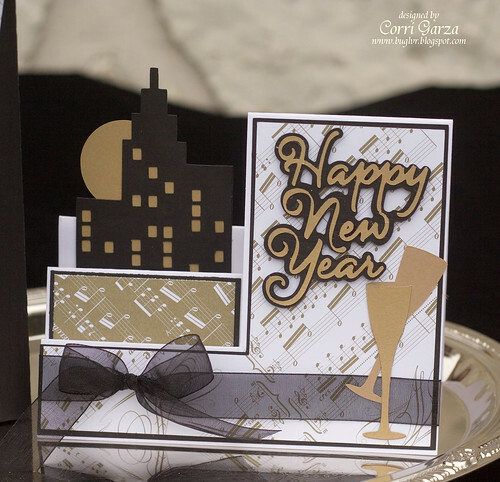 I cut the Happy New Year and glasses with my Silhouette Cameo using a free file from SVG Cuts. 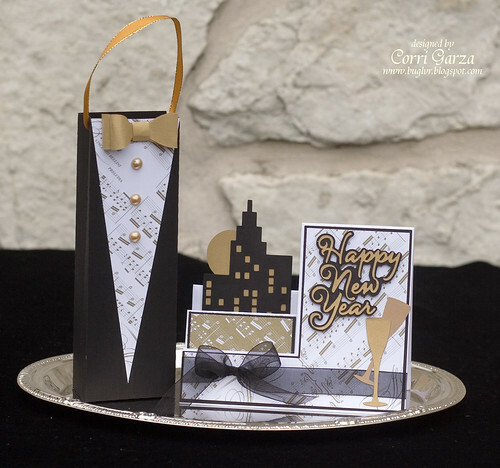 The cityscape and bag are from the SVG Cuts - New Year's Eve SVG Kit. I love this gift bag....some simple to assemble and I love how elegant it looks. It would make a perfect hostess gift. This is very elegant! It's so hard to find New Year's gift ideas and this is perfect! TFS. Stunning set! Love the colors and cuts.